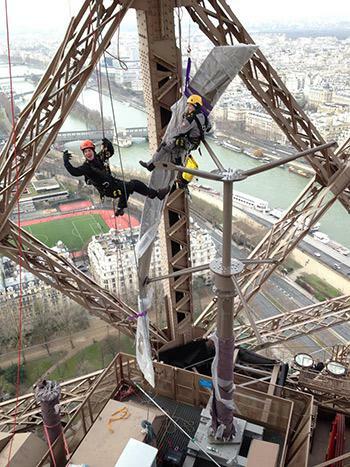 At 400 feet above ground level, installing the Eiffel Tower’s new wind turbines was a tricky endeavor. As part of its “first major face-lift in 30 years,” the Eiffel Tower has a new set of wind turbines. Earlier this year, the New York City–based renewable-energy design firm UGE installed the turbines, which are now spinning above the tower’s second level, 400 feet above ground level. The installation of the turbines was tricky. Each of the two custom-built blades had to be perilously lifted in place by rope. I spoke with UGE’s Jan Gromadzki, who managed the installation from mid-January to early February. The wind turbines aren’t big. They’re designed to produce about 10,000 kWh of electricity each year, enough to offset the tower’s electricity use in commercial areas—equivalent to the annual average use of a single U.S. home. In addition to the wind turbines, the tower’s environmentally friendly retrofit includes LED lighting and a rainwater recovery system that pipes water directly to toilets on site. “It’s just two wind turbines. It’s definitely high-profile, but it’s not the biggest project we’ve done in terms of energy generation,” Gromadzki said. Gromadzki noted that the Eiffel Tower is already 100 percent powered by renewable energy, which is produced off site as a part of a citywide goal to reduce greenhouse gas emissions 25 percent by 2020 and 75 percent by 2050. So, the new wind turbines are more a publicly visible manifestation of that goal, rather than a meaningful step toward achieving it. A worker installing a new wind turbine is suspended by a series of cables within the Eiffel Tower. With a helical shape rather than the more well-known stick-and-pinwheel design, the turbines are also very visually striking, yet specially painted to blend in to the tower’s aesthetic. Gromadzki says the nontraditional design means that the turbines are virtually silent and don’t produce any vibrations. For architectural purists wondering how such a 21st-century addition to a World Heritage Site could pass muster, the Eiffel Tower has long been at the forefront of the technology of the day. It has functioned as a broadcast tower for more than 100 years—in 1903, Gustave Eiffel saved it from a planned demolition by turning it into a long-range radio antenna. 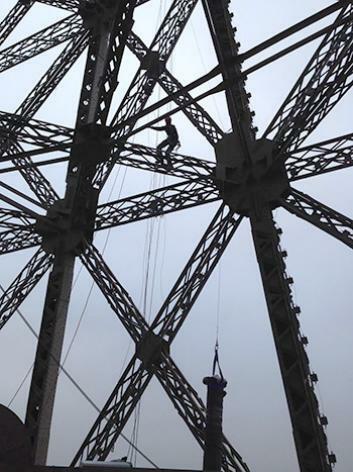 The energy retrofit on the iconic Paris landmark comes as the city prepares to host a major U.N. summit on climate change later this year, which is expected to culminate in the world’s first comprehensive agreement on climate change action.